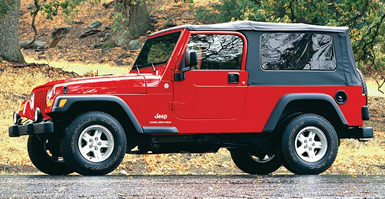 San Francisco: The Jeep Wrangler is one of the worlds best 4 wheel drive vehicles that you can buy today. No one has ever questioned the Wranglers ability to cross the Rubicon trail or go off road virtually anywhere in the world. Its the rather harsh ride that most people complain about. Well that problem has been solved. Meet the new for 2004 Jeep Wrangler Unlimited. The keepers of the Jeep Wrangler Heritage finally agreed that by stretching the original Jeep Wrangler frame and adding 10 inches to the wheelbase and 5 more inches to the rear overhang, they could still build a Jeep Wrangler rock climber but now with a better ride. This 15 inches increase in overall length allows for 2 more inches of passenger legroom and an increase of 13 inches in cargo space. Cargo volume goes from 9 cubic feet to 29 cubic feet, a huge increase to store more of the stuff that you want to take with you on a camping trip or a run to the lake. The Jeep engineers also made improvements to reduce the noise levels in the truck by increasing the sound deadening under the hood, behind the dash, on the firewall and under the entire cargo area. In addition to the extra padding there are new tip & slide front seats, a new Sunrider Softop that partially folds back for a front sunroof effect and an optional $795 hardtop for better security and weather protection. The Wrangler Unlimited weighs about 200 pounds more that the standard Wrangler, but improvements in the ride and handling plus reduction in noise and vibration are fantastic, and worth the extra weight. The Unlimited model smoothes out the Wranglers bumpy ride considerably. While not to be confused with a car like ride this is a more civilized version of the Wrangler. Minor revisions in breakover angles and turning radius are off set by a substantial increase in towing capacity from 2000 lbs to 3500 lbs. This addition in towing strength is attributed mainly to the addition of more frame members added to the stretch model. Now a Wrangler Unlimited can tow the boat with 4 people seated more comfortably, and haul all the gear needed for a fun trip with some room to spare. Power for the Unlimited comes from the same great Wrangler Power Tech 4.0L straight six-cylinder engine producing 190 horsepower bolted to a 4-speed automatic transmission. All Wranglers have Command-Trac 4-wheel drive transfer cases. A manual gearbox will be available in the 2005 model year for those gearheads that just have to have a stick shift to play with. The Unlimited option comes standard with air conditioning, AM/FM with CD player, power steering and a host of additional features like in-dash tachometer and a full padded sports bar. The base sticker price for the Unlimited Wrangler is $24,995 including a $610 destination charge. My test vehicle was a Flame Red Clear Coat Wrangler Unlimited with Dark Slate Gray Interior and the standard black soft top. The options included a leather wrapped steering wheel, electronic speed control, seven speaker audio system including a subwoofer, a Sentry Key Theft-determent system and body side step plates. The total MSRP came to $28,815 plus the state sales tax and license plate fees. Not cheap by any means but a fair price for a Jeep that can do what most other vehicles can never do. And now it can do it with an even better ride, a quieter cabin, triple the cargo room and more towing capacity. This is the best Jeep Wrangler model overall and will surely find a lot of new buyers.